Johnny is a Navy veteran turned student and cosplayer. Currently attending University of California San Diego for Structural Engineering he creates costumes as a hobby for both fun and profit. Starting cosplay in 2011 with few tools and resources he was given the chance to work on a team to create a promotional piece for Bioware's Mass Effect 2 at San Diego Comic Con 2011. From there he started working professionally as a prop maker and model while still attending college. His list of professional credits include pieces made for Riot Games and their hit game League of Legends, Rooster Teeth with and their popular web series RWBY as well as KOG Studios and their MMORPG Elsword Online. 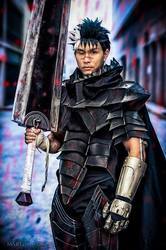 Even with a large background in video game costuming he still works closest with Crunchyroll.com as a Cosplay Ambassador, creating promotional pieces for their streaming anime, most notable of which being Attack on Titan. His hope is not for fame, or fortune from cosplay, but to share his trade and teach cosplayers how to make props and armor so that they can share the same joy he has.